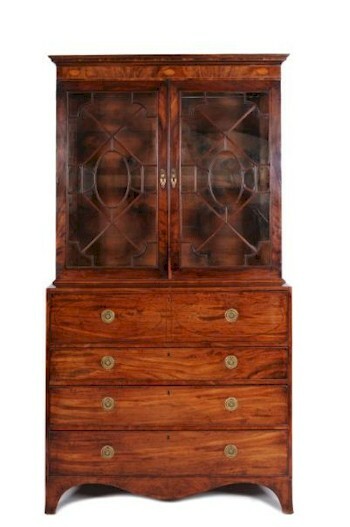 The reigns of George II and George III are principally associated with mahogany and the golden age of furniture making. Whilst the 17th Century provided us with few cabint makers' names to remember, the 18th Century produced a host of them, notably: Thomas Chippendale, George Hepplewhite, Thomas Sheraton, Thomas Johnson, John Linnell, John Channon and Hiles Grendey, to name but a few. A George III mahogany crossbanded and inlaid secretaire bookcase (FS16/754) that sold for £950 in the fine furniture auction in our October 2012 Fine Art Sale. Mahogany is a wood indigenous to the Americas and, particularly, Central America and the West Indies. The name mahogany was initially associated with the islands in the West Indies under British control, the French using the term acajou and the Spanish Caoba. The term mahogany may be a corruption of m'oganwo, the name used by the Yoruba and Ibo people of West Africa to describe trees of the genus Khaya. When transported as slaves to Jamaica, they saw similar trees and gave them the same name. Thomas Chippendale (Senior) (1718–1779) is arguably the most famous furniture maker of the 18th century and, probably, of all time. Chippendale was the author of the Gentleman and Cabinet Makers Director and is often described as the Shakespeare of English Furniture makers. 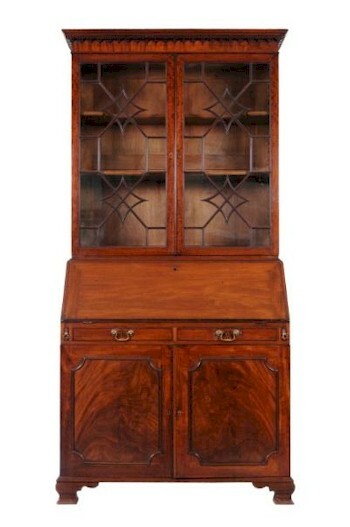 A George II mahogany bureau bookcase (FS17/816), which realised £1,150 in an auction of fine mahaogany furniture in Exeter. Chippendale's workshops were established in St Martin's Lane in London in 1754 and, apart from patronage by the Royal Family, Chippendale was commissioned to produce furniture for families in the South West, such as at Hestercombe House in Somerset for Coplestone Warre Bampfylde, at Saltram House in Devon for Lord Boringdon and at Sherborne Castle in Dorset for Lord Digby. George Hepplewhite is almost as well known, although he was a very elusive figure and was recorded in only one trade directory. In fact, it was two years after Hepplewhite's death that his book of designs The Cabinet Makers and Upholsterers Guide was published. A George III satinwood writing and work table (FS18/809) that realised £2,100 in our April 2013 Fine Art Auction. Thomas Sheraton (1751–1806) is principally remembered for his three pattern books, with his cabinet maker and upholsterers' drawing book being published by subscription in fortnightly issues, priced at one shilling. It is unlikely that any of these famous names made very much, if any of the pieces of furniture now attributed to them. 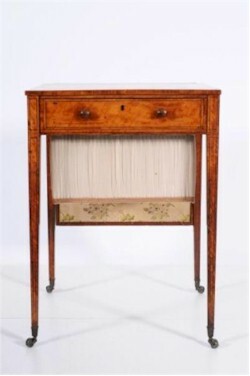 Bearnes Hampton & Littlewood's quarterly auctions will often ascribe a piece of furniture as being in the Chippendale taste, meaning that it is based on an original design by the great man. If he had made all of the pieces described as Chippendale, he would indeed have been a busy man!